Forensic medicine - the science that deals with the application of medical knowledge to legal question. Clinical Forensic Medicine - involves an application of clinical methods for the administration of justice. Paulus Zacchias - father of legal medicine as well as father of forensic psychiatry. Medical Ethics - deals with the moral principles which should guide members of the medical profession in their dealings with each other, their patients and the state. Medical Etiquette - deals with the conventional laws of courtesy observed between members of the medical profession.A doctor should behave with his colleagues as he would have them behave with himself. Hippocrates - father of medicine, discussed lethality of wounds and formulated medical ethics. Forensic Pathology - deals with the study and application of the effects of violence or unnatural disease in its various forms in or on the human body, in determining the cause and manner of death in case of violence, suspicious, unexplained, unexpected, sudden, and medically unattended death. Pathology - is the precise study and diagnosis of disease. Pathologist - a medical doctor who conducts an autopsy. Autopsy - post mortem examination of a corpse. 1. To find out the time of death. 2. To find out the cause of death. 4. To establish the identity of the body. Exhumation - is the digging out of an already buried body from the grave. Disease - is an abnormal condition affecting the body of an organism. Cadaver - also called corpse, is a dead human body. Carcass - dead body of an animal. Injury - is damage to a biological organism which can be classified on various bases. wound - is a type of injury in which the skin is torn, cut, or punctured or where blunt force trauma causes a contusion. open wound - is a break in the skin's surface resulting in external bleeding. 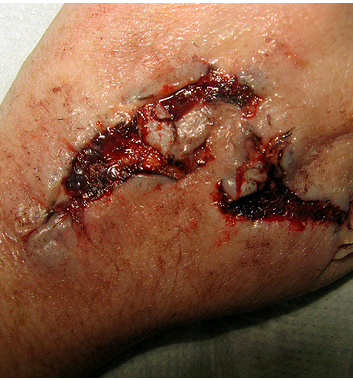 closed wound - the skin is not broken open and remains intact. incised wound - caused by a clean, sharp edged object such as a knife, razor or a glass splinter. laceration - irregular tear like wound caused by some blunt trauma. 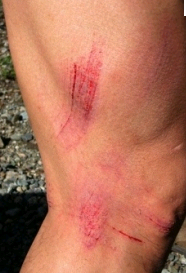 abrasion - (grazes) - superficial wound in which the top most layer of the skin is scraped off. Are often caused by a sliding fall into a rough surface. 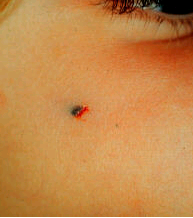 puncture wound - caused by an object puncturing the skin such as nail. 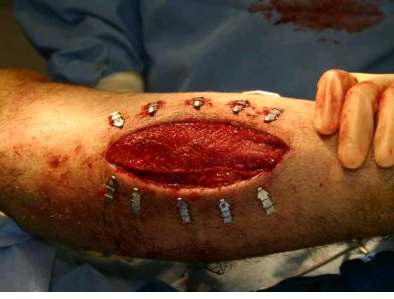 penetration wound - caused by an object such as a knife entering and coming out from the skin. 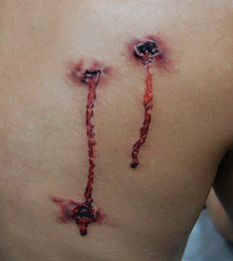 gunshot wound - caused by a bullet or similar projectile driving into or through the body. There may be two wounds, one at the site of entry and one at the site of exit generally referred to as through and through. contusions - commonly known as bruises, caused by a blunt force trauma that damages tissue under the skin. 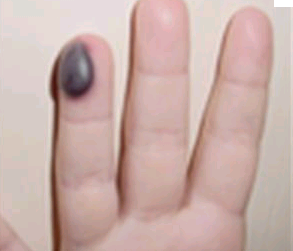 hematoma - called blood tumor, caused by damage to a blood vessel that in turn causes blood to collect under the skin. Ante Mortem - before death. Post Mortem - scientific term for after death. Cadaver tag - an identification tag attached to the cadaver containing tag number, name if identified, date/time and place of recovery, date/time of incident, gender, other pertinent information and name of the investigator. In articulo mortis - at the point of death. Rigor mortis - stiffening of the body after death. lividity - process through which the body's blodd supply will stop moving after the heart has stopped pumping it around the inside of the deceased. Necrophagus - this type of organism feeds directly on decomposing tissue. 37 degrees celsius or 98 degrees fahrenheit - average body temperature. Vital signs -are measures of various physiological statistics often taken by health professionals in order to assess the most basic body functions. Death - cessation of all biological functions that sustains a living organism. predation - biological interaction where a predator (organism that is hunting) feeds on its prey (the organism that is attacked). livor mortis - settling of the blood in the lower dependents of the body. algor mortis - reduction in body temperature following death. rigor mortis - the limbs of the corpse become stiff and difficult to move. decomposition - reduction into simple form of matter accompanied by strong unpleasant odor. Cadaveric Spasm - sudden rigidity of the muscle immediately after death. A rare form of muscular stiffening that occurs at the moment of death,persists into the period of rigor mortis and can be mistaken for rigor mortis. When does the stiffness of death begin to disappear? after 36 hours. What is the rate of temperature change to a body after death? after one hour,body temperature drops 1 to 1 1/2 degrees per hour. Dying Declaration - is a testimony that would normally barred as hearsay but may nonetheless be admitted as evidence in certain kinds of cases because it constituted the last words of a dying person. Nemo Morituros Praesumitur Mentiri - a dying person is not presumed to lie. Zombie - an animated corpse brought back to life by mystical means such as witchcraft. Coffin Birth - (post Morten fetal extrusion) - is the expulsion of a non viable fetus though the vaginal opening of the decomposing body of a pregnant woman as a result of the increasing pressure of the intra abdominal gases. Code of Hammurabi - King of Babylon (4000 to 3000 BC) is the oldest known medico legal code. Bologna, Italy - where the first medico-legal autopsy was done. Bartolomeo de Varignana - conducted the first medico-legal autopsy in Italy in 1302. Fortunato Fedele - an Italian physician who in 1602 published the first book on forensic medicine. Inquest - is the legal or judicial inquiry to ascertain a matter of fact. Euthanasia - (mercy killing) - it means producing painless death of a person suffering from hopelessly incurable and painful disease. It is not allowed by law in the Philippines. Malingering/Shamming - means conscious, planned feigning or pretending disease for the sake of gain. The Rule of Haase - is used to estimate age of fetus.The length of the fetus in cm. divided by five, is the duration of pregnancy in months. Forensic Entomology - is the use of insects and their arthropod relatives that inhabit decomposing remains to aid in legal investigations. What are the 5 stages of insect development? What are the 2 methods of biological forensics are concerned with? entomology and DNA. Residence time - this defines how long an insect colony has been at a corpse. The body farm - used for entomological experiment.This place exists at the University of Tennessee.